Early Jurassic predatory dinosaurs are very rare, and mostly small in size. Saltriovenator zanellai, a new genus and species is the oldest known ceratosaurian, and the world's largest (1 ton) predatory dinosaur from the Lower Jurassic (Sinemurian, ~198 Mya). 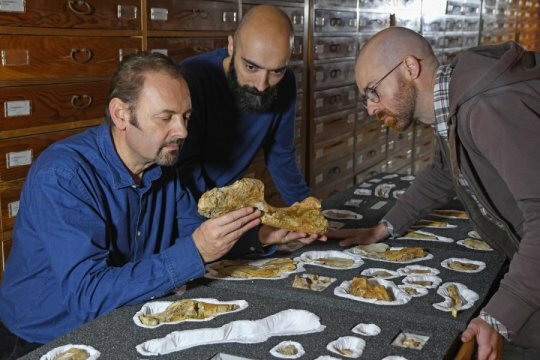 At the Natural History Museum of Milan, paleontologist Cristiano Dal Sasso (left) and co-authors Simone Maganuco and Andrea Cau (center and right) examine the bones of Saltriovenator, deposited in the Museum collections. Early Jurassic predatory dinosaurs are very rare, and mostly small in size. Saltriovenator zanellai, a new genus and species described in the peer-reviewed journal PeerJ -- the Journal of Life and Environmental Sciences by Italian paleontologists, is the oldest known ceratosaurian, and the world's largest (one ton) predatory dinosaur from the Lower Jurassic (Sinemurian, ~198 Mya). This unique specimen, which also represents the first Jurassic dinosaur from Italy, was accidentally discovered in 1996 by a fossil amateur within a quarry near Saltrio, some 80 km N-E of Milan. Many bones of Saltriovenator bear feeding marks by marine invertebrates, which represent the first case on dinosaurian remains and indicate that the dinosaur carcass floated in a marine basin and then sunk, remaining on the sea bottom for quite a long time before burial. Although fragmentary, "Saltriovenator shows a mosaic of ancestral and advanced anatomical features, respectively seen in the four-fingered dilophosaurids and ceratosaurians, and the three-fingered tetanuran theropods, such as allosaurids," says first author Cristiano Dal Sasso, of the Natural History Museum of Milan, who reassembled and studied the fossil for several years. "Paleohistological analysis indicates that Saltriovenator was a still growing subadult individual, therefore its estimated size is all the more remarkable, in the context of the Early Jurassic period," says co-author Simone Maganuco. The evolution of the hand of birds from their dinosaurian ancestors is still hotly debated. "The grasping hand of Saltriovenator fills a key gap in the theropod evolutionary tree: predatory dinosaurs progressively lost the pinky and ring fingers, and acquired the three-fingered hand which is the precursor of the avian wing," remarks co-author Andrea Cau.